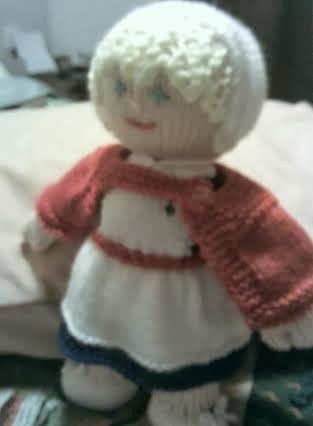 The Newlife Foundation have a knitting pattern for a Nurse doll and they sell them to help provide money for things they need. The Newlife Nurses provide help and support for the children and their families and my little Nurse doll will help as well. 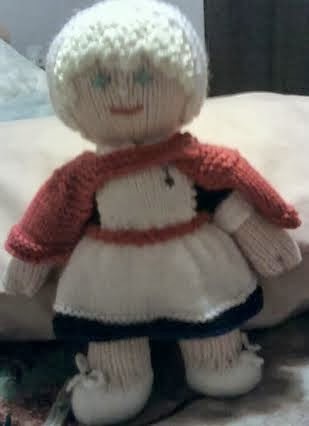 As I started knitting her I decided she was going to named Annabel no particular reason she just looked liked an Annabel to me. She was easy to make and they provide a Birth Certificate for each doll with her name, where she was made and who created her. She will be a Collectible item as each doll is unique, they all have different hair and eye colours along with facial expressions. You can add freckles or spectacles as well, I added a little nose it is not in the pattern but I think she looks cute with a nose. So Annabel will be posted off along with Patches. I hope they will like them and that they will sell and bring enjoyment to someone.